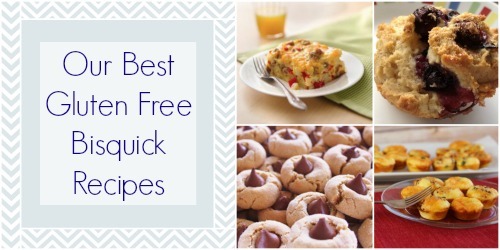 Now that you can easily find gluten free Bisquick in your grocery store, you have all of these easy recipes available to you. Before, if you saw Bisquick in an ingredient list, you would immediately toss out the recipe as a loss. Fortunately, those dark days are in your past, and you can now enjoy all the Bisquick recipes your heart desires. You won't have to worry about gluten sneaking into your baking dish or mixing bowl, so you can feel safe when you serve these recipes to your family. In this compilation of our 8 Best Gluten Free Bisquick Recipes, you'll find easy breakfast recipes and homemade snack recipes. It doesn't matter if you're short on time because all of these recipes are super simple to make. These recipes are simply the best, and we think that you’ll agree. You'll love these recipes, so you should try them all. Then, come back and let us know which one was your favorite. Below you'll find our best Bisquick breakfast recipes, but, for even more options, you can try one of these 15 Gluten Free Breakfast Recipes. When your alarm clock goes off at the crack of dawn (or a little later if you're lucky), you should be prepared with one of these gluten free Bisquick recipes. Between the pancake recipes, cinnamon roll recipe, and breakfast bake recipe, it'll be hard to decide which gluten free breakfast recipe to try first. No matter which one you decide to try, your family will be ecstatic with your choice. You really can't go wrong with any of these easy Bisquick recipes. Want some amazing gluten free snacks? Check out these 13 Homemade Gluten Free Snack Recipes. Finding a good gluten free snack is often a pain. Either they're too expensive or they just taste odd. Instead of buying gluten free snacks, you should make one of these gluten free Bisquick recipes. These easy gluten free recipes would be perfect to make for an afternoon snack or a lunch time treat. It doesn't matter if you make these gluten free snacks for kids or adults because everyone will love these recipes.